A couple weeks ago I mentioned using Windows 7's cool Aero Snap feature to simplify file management. Basically, you open two instances of Windows Explorer, then place them side by side by dragging the windows to opposite edges of the screen. What I neglected to mention is that you can accomplish this much faster by using keyboard shortcuts. In other words, instead of dragging each window to a screen edge, waiting for it to half-maximize, letting go the mouse button, and repeating with the other window (whew--so much work! 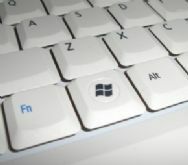 ), all you need is the Windows key. While we're on the subject, Windows-Up Arrow maximizes the selected window, while Windows-Down Arrow returns it to its previous location and size. And here's one more timesaving tip: You can quickly open that second instance of Explorer by middle-clicking its icon in the taskbar.